I saw these coffee bean candles and really wanted one. They were so neat looking and I imagined they smelled wonderful. But, then I realized that I could probably figure out how to make it myself. You don't need candle-making supplies for this one. It's pretty simple to make. Total Time: About 20 minutes, plus time for it to cool and harden. Source: A candle I had seen on etsy was this inspiration. 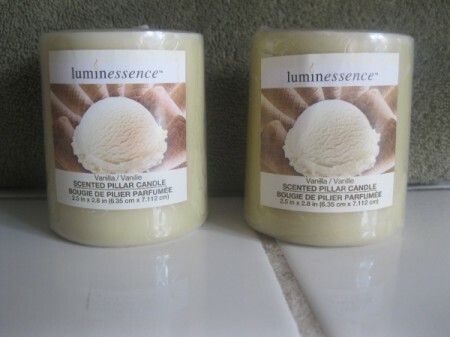 2 candles from the dollar store or any other votives you may have - I like using the vanilla-scented ones. some coffee beans, amount depends on how big your container is and how big your candle is - a handful was enough for mine. glass cup or another mold for your candle to be formed in. My votive was a little too big for my container and I couldn't fit the coffee beans all around it. If you have the same problem, melt all around the candle in your pan over very low heat. Rotate the candle to get it as even as possible. It doesn't need to be perfect. You just don't want the coffee beans next to the wick, to avoid starting a fire. I don't know if they would set on fire, but I sure don't want to find out! I don't want you to find out, either. If using a metal pie tin, put over very low heat. The pan will get hot. Use oven mitts to handle. Don't burn yourself! Once your candle is the right size, put candle in the middle of your mold. 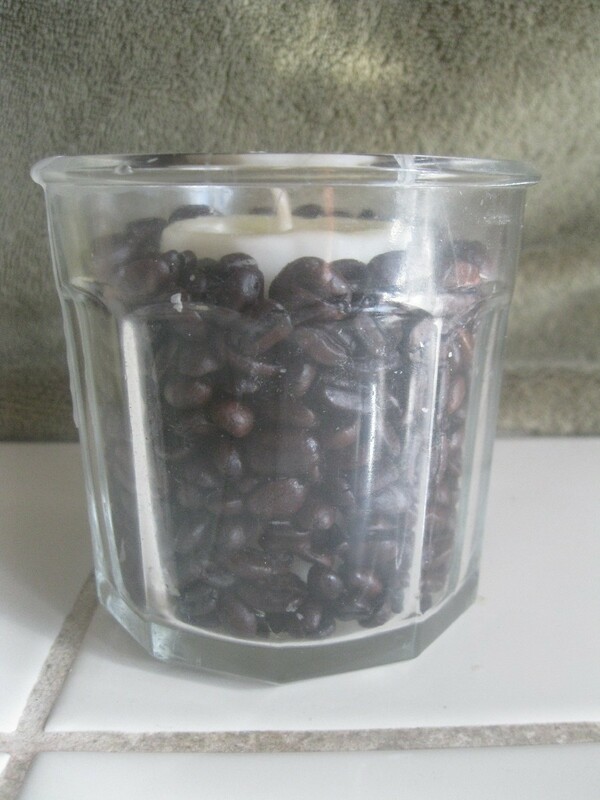 Place coffee beans all around the outer part of the candle. Get them as evenly distributed as possible. 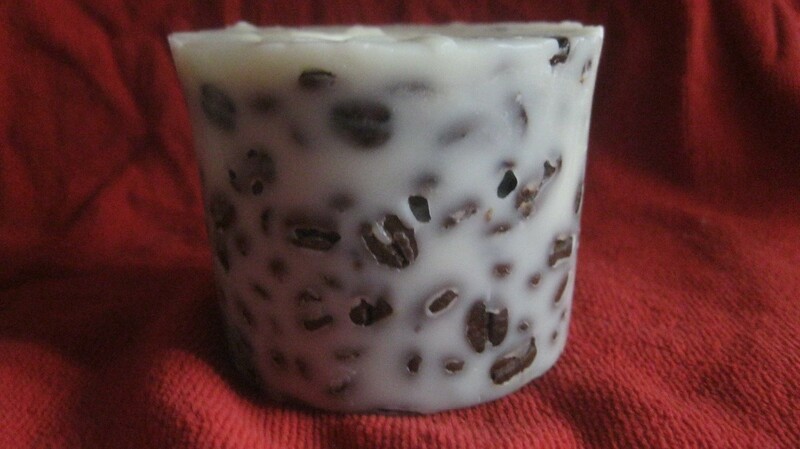 Stop beans about 1/4 an inch from the top of your core candle. 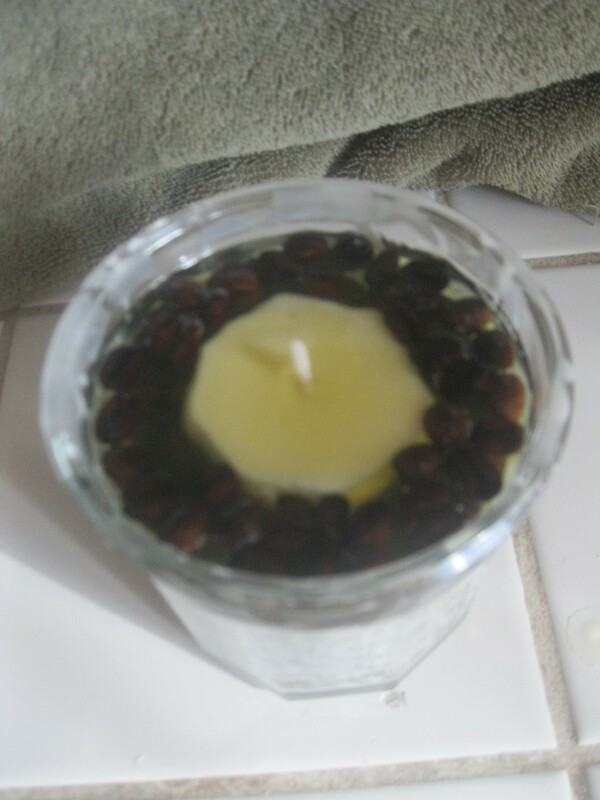 Carefully and slowly pour wax over the coffee beans til you reach the top of the candle. If your container is too large, you may need another candle for extra wax. If any coffee beans float up and stray toward the wick, use a toothpick to push those babies back to their place. You need to babysit the candle for a few minutes til it starts to harden. If a coffee bean gets next to the wick and sets up, it's there to stay. 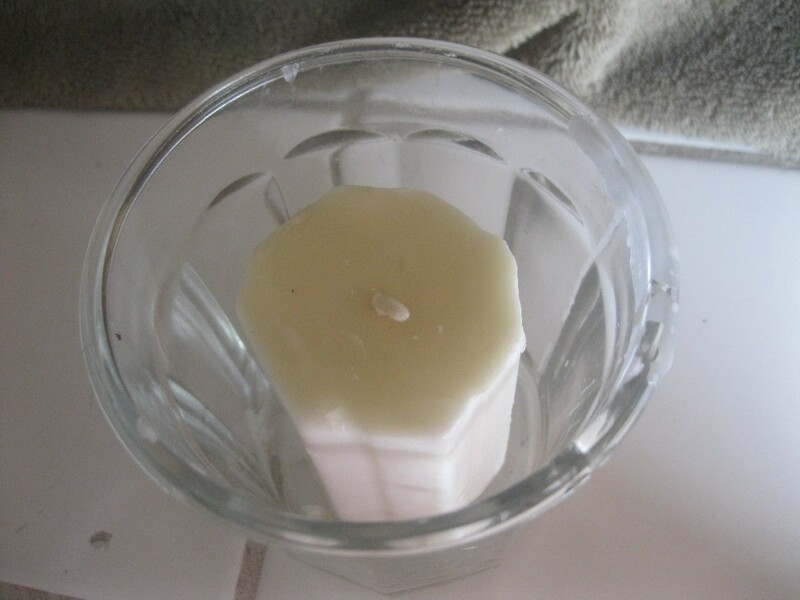 Once your candle is totally firmed up (give it a couple of hours), pop it out of your mold. If it's stuck, you can put it in the freezer for a few minutes. It should then come out. If you still can't get it out, just enjoy it in your container. That's nice, too! Enjoy the beautiful aroma of your candle. Make sure you don't leave burning candles unattended. I think I might try this, I bet these smell amazing, I love the smell of coffee beans! I have to try this! Thank you. Thank you for writing the steps for this so clearly. I'm still fairly new when it comes to "crafting" so I appreciate instructions that are easy to understand. Sounds like a lovely idea. I've some very old coffee beans, just the job!